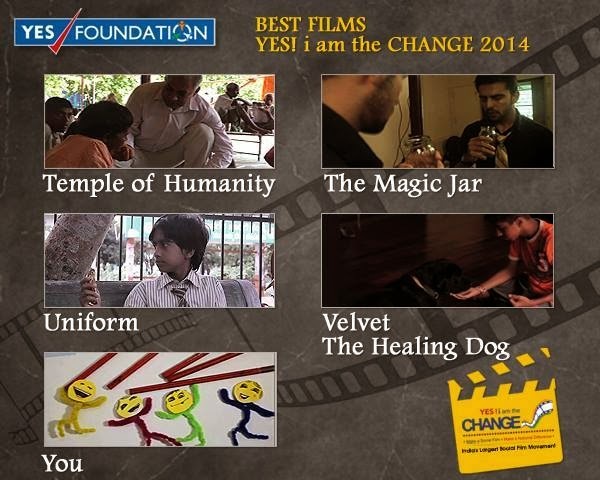 IDF Social Ambassadors @ YES im the Change 2014, YES FOUNDATION. 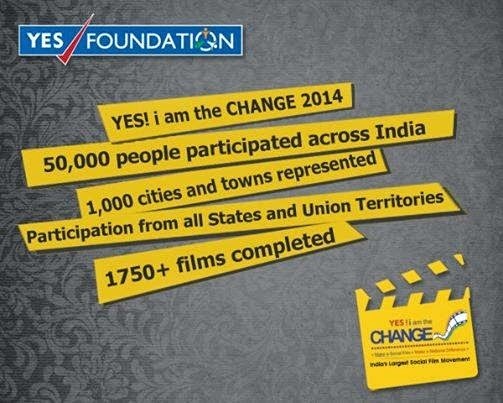 YES FOUNDATION,the social development arm of YES BANK, organized the second edition of its social initiative - YES! i am the CHANGE. 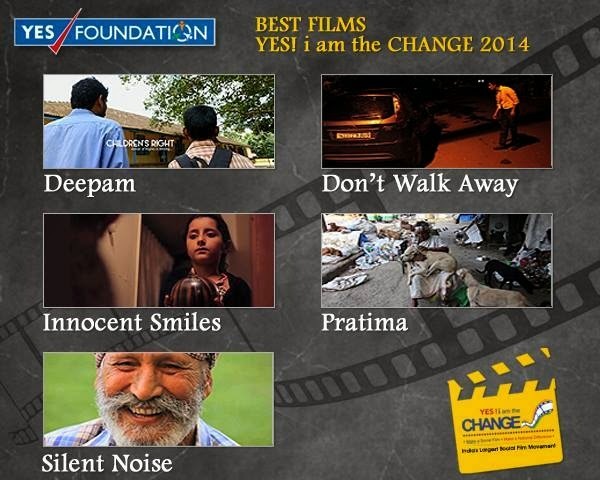 This nationwide initiative aims to provide the youth a platform to contribute to India’s social development through film making.These films were evaluated by Guneet Monga, Vikramaditya Motwane, Pritish Nandy, Nina Lath, Shoojit Sircar, Kailash Surendranath, Dr. Nagesh Rao and Dr. Indu Shahani. 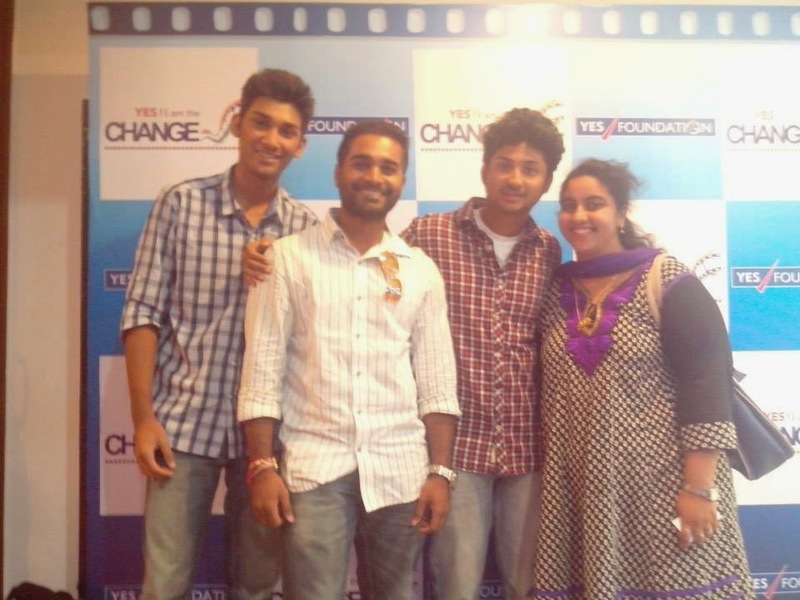 IDF Social Ambassadors Salma Memon, Akshay Joijode, Adhiraj Lokegaonkar and Tabish Khan participated at Nehru Science Center for the event. “The Prime Minister has ignited the candle of cleanliness among Indians to make India clean. He has asked Indians to restore the culture of sanitation which Indians had during Harappa civilization. We should join hands with the Prime Minister with all the might and resources, one has to make India clean and free from defecation in the open. Be civilized, be cultured, be clean, make India clean and standout in the row of civilized, cultured and clean nations”, observed Dr. Bindeshwar Pathak, while receiving the Mother Teresa Award 2014 from Dr.M.S. 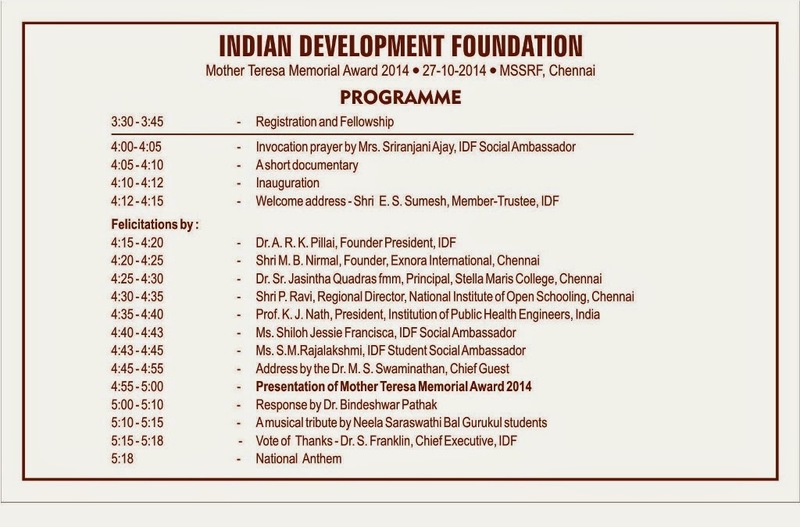 Swaminathan at a function organized by Indian Development Foundation at MSSR Foundation, Taramani, Chennai on 27th of October 2014. ‘It gives me immense pleasure to receive an honour in the name of Mother Teresa, who set a sterling example for serving the sick and needy. The efforts of Indian Development Foundation in enlisting people’s participation and support for national health and development programs is noteworthy’ he added. Dr. Bindeshwar Pathak, founder of Sulabh International was conferred with the prestigious Mother Teresa Memorial Award 2014 for his five decades of relentless contributions to India’s sanitation, health and hygiene movement. Dr. M.S. Swaminathan, Founder Chairman and Chief Mentor of MSSRF paid glowing tributes to Dr. Bindeshwar Pathak for his historic contribution to the national sanitation programmes. Dr. Pathak’s great initiatives in sanitation technology will spearhead the national Clean India movement, he observed. Dr. V Shanta, Chairperson, Adyar Cancer Institute - Shri M. B. Nirmal, Founder, Exnora International - Dr. Jasintha Quadras, Principal, Stella Maris College, Chennai - Shri P. Ravi, Regional Director, National Institute of Open Schooling and Prof. K. J. Nath, President, Institution of Public Health Engineers, spoke in appreciation of the exemplary services of Dr. Bindeshwar Pathak and called him the Messiah of the masses. IDF social ambassadors Ms.Shiloh Jessie Francisca, Ms. S. M. Rajalakshmi and Mrs. R. Rajammal, felicitated the septuagenarian and touched many hearts. Dr. ARK Pillai, founder IDF and team called on Dr. Bindeshwar Pathak, founder, Sulabh International at Chennai on 26-10-2014. 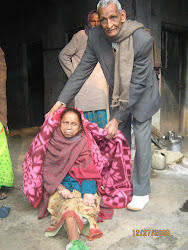 Dr. Bindeshwar Pathak will receive Mother Teresa Award 2014 at MSSR Foundation, Chennai on 27th Oct. 2014 for his excellent contributions to India's sanitation, health and hygiene movement. The Award is instituted by Indian Development Foundation. Team IDF - Dr. Narayan Iyer, Dr. S. Franklin and Mr. S. Sreeram joined Dr. Pillai in lauding the efforts of Dr. Pathak through Sulabh Sanitation Movement. Sumana Halli Project - Deepavali Celeberations. 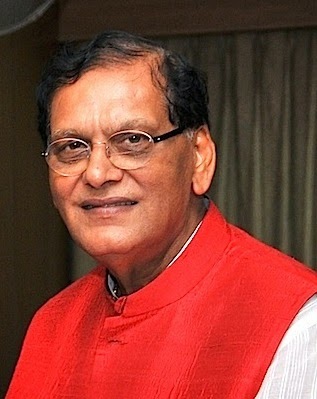 Indian Development Foundation (IDF) has chosen Dr. Bindeshwar Pathak, Founder, Sulabh International for the prestigious Mother Teresa Memorial Award 2014 for his excellent contributions to India's sanitation, health and hygiene movement. 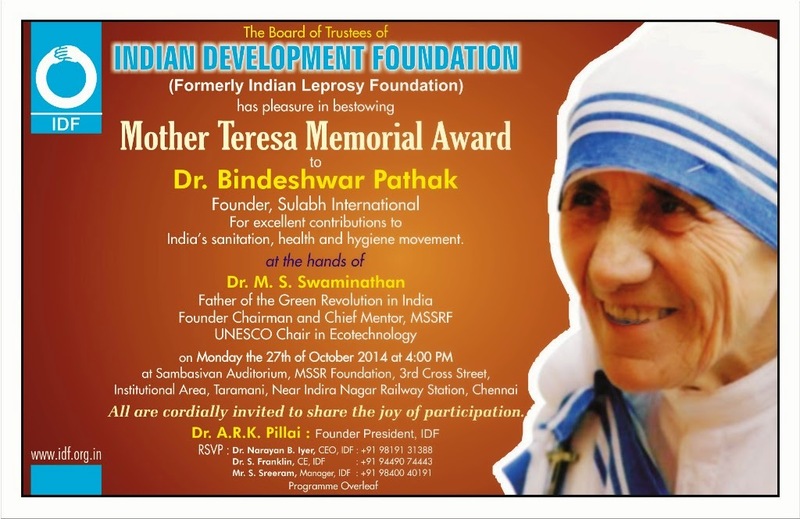 Recipient of Padma Bhushan and Stockholm Water Prize, Dr. Bindeshwar Pathak will receive the Mother Teresa Award on 27th Oct. 2014 at MSSR Foundation, Taramani, Chennai at 4:00 PM. IDF Social Ambassadors - Anuva and Santrias studying in Montfort School,Trichy.Tamil Nadu.Through their support and social initiatives, IDF will be able to reach-out many needy people and students. Both have spoken on, how one should never give up and and work hard because it will lead to success. Let's together spread the message of goodness. Join hands with IDF and feel the difference - info@idf.org.in. World Food Day 2014 @ Kendriya Vidyalaya , Madambakkam, Chennai. Every year, the entire world observes the 16th of October as the World Food Day. As a part of the world food day celebration, Indian Development Foundation organised a drawing & slogan competition at Kendriya Vidyalaya No. 2, Madambakkam, Chennai.The theme of this year's World Food Day, "Family Farming-Feeding the World and Caring for the Earth. Around 200 students participated in the competition, which is a positive sign in the student community. The fact that having access to good, healthy food is a basic human right. Of the over 7 billion people in the world, one in nine suffers with chronic hunger. That is about 805 million people worldwide who live their lives with serious hunger issues. And the sad part is that the world’s most vulnerable make up the majority of that 805 million. More than half of the hungry in the world are women. In fact 60 percent are women. If that’s not bad enough, 5 million children under the age of 5 die of malnutrition-related issues yearly. Ms. Anitha, Social Ambassador, IDF and Mr. Sathyamurthy, Development Executive also participated in the event. The event was co-ordinated by Mrs. Rajammal and Mrs. Padma Balakumar. IDF Social Ambassador : Pranav S. - studying in Class XII in R.S.K Higher Secondary School, BEHL-Trichy.Tamil Nadu. Through his support and social initiatives, IDF will be able to reach-out many needy people and students.He has spoken how impossible word itself says I am possible and how social activity can give inner peace in a simple way.Join hands with IDF and feel the difference - info@idf.org.in. IDF Social Ambassadors - Ms. Aparna P. and Ms. Deepikaa Devi - studying in Class XII in R.S.K Higher Secondary School, BEHL-Trichy.Tamil Nadu. Through their support and social initiatives, IDF will be able to reach-out many needy people and students. Both have spoken on importance of education, stressing girl-child education. Let's together spread the message of goodness. 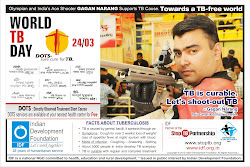 Join hands with IDF and feel the difference - info@idf.org.in. 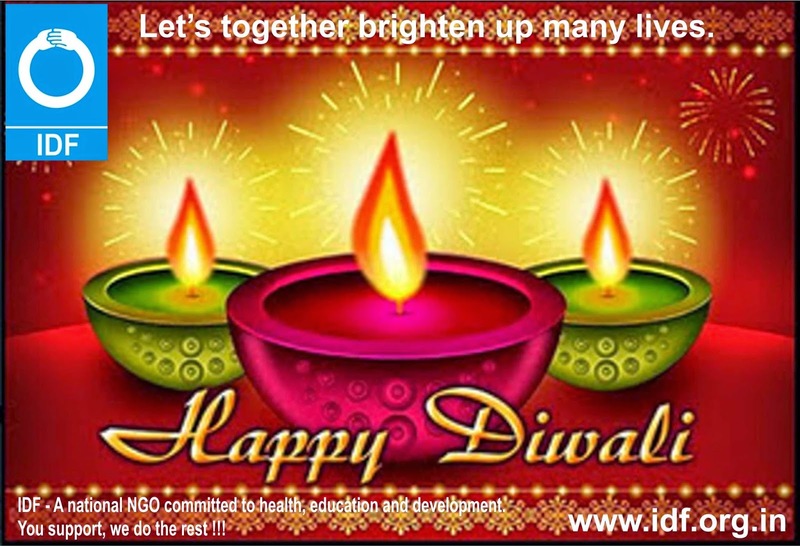 Diwali with a difference.... Let's brighten-up many lives. Indian Development Foundation in collaboration with various social organizations and educational institutions will organize Diwali Festival with the inmates and children of Vimala Dermatological Centre, Versova, Yari Road, Mumbai on Saturday - 18th October 2014 at 3:00 PM. All are cordially invited to participate and share festive joy and happiness. IDF has been organizing such citizens reach-out programme during festive occasion at various centres in India for over 3 decades now. An opportunity for citizens to spread happiness. IDF social ambassadors and team across India will be organizing similar such events in Bal Gurukuls and other centres. We seek your blessings and kind support. 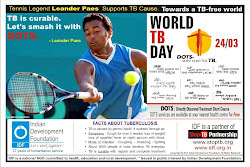 Those who wish to contribute for the cause of leprosy and education projects may do so. Don't postpone goodness in life.... Let's together brighten-up many lives. 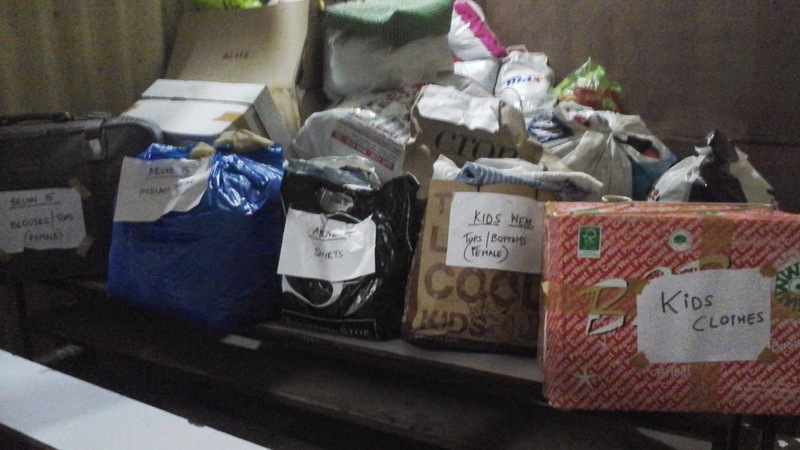 Donations to IDF are exempted under section 80-G of Income Tax Act. IDF Social Ambassadors Joshua Jasper & R S Lalitha studying in Montfort School,Tirchy,Tamil Nadu.Through their support and social initiatives, IDF will be able to reach-out many needy people and students. Students of the Interact Club of R.N. Podar School, Santacruz, Mumbai mobilized materials for Jammu Kashmir under a special Campaign called `Rebuilding Paradise'. 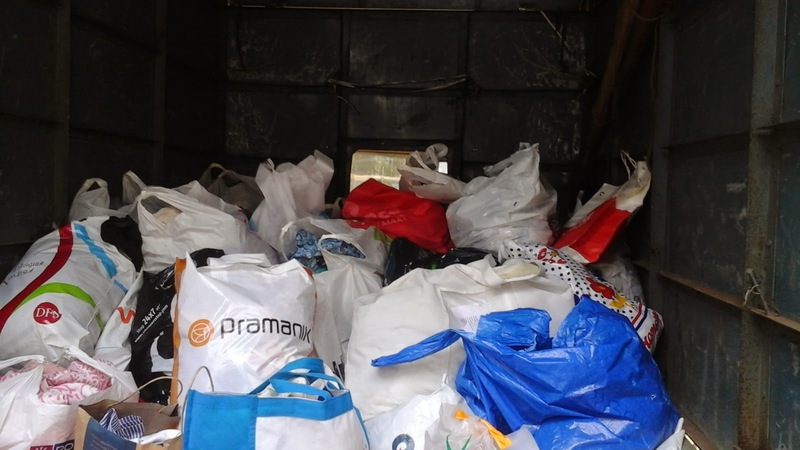 The material were received by Team Indian Development Foundation and sent to Goonj : organization working for JK Flood Relief work. 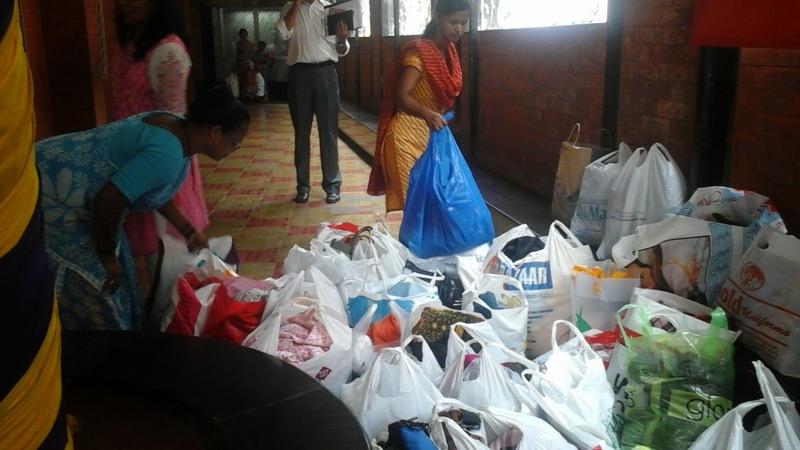 IDF appreciates the great work of Interact Club and all the student volunteers of RN Podar for generously donating materials for the cause. It was indeed a satisfying and fulfilling day for Team IDF to visit St.Theresa Bal Gurukul at Malayadipatti, Manaparai, Trichy on 10th Oct 2014. 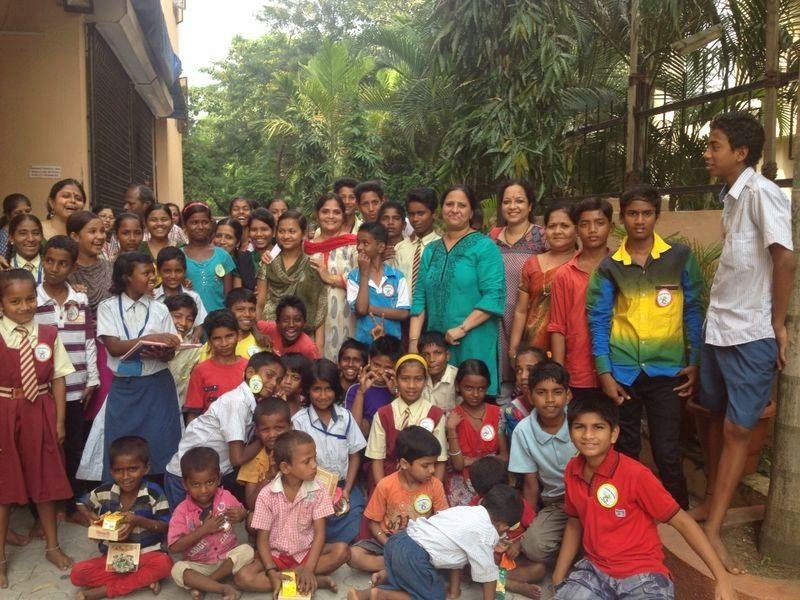 Team IDF consisting - Dr. ARK Pillai, Dr. Narayan, Dr. Franklin, Sreeram, Manimala and Solomon - met the children and appreciate the wonderful progress achieved by all the children in the Bal Gurukul - in academics, social and extra-curricular. Rev. Sr. Vimal and Rev. 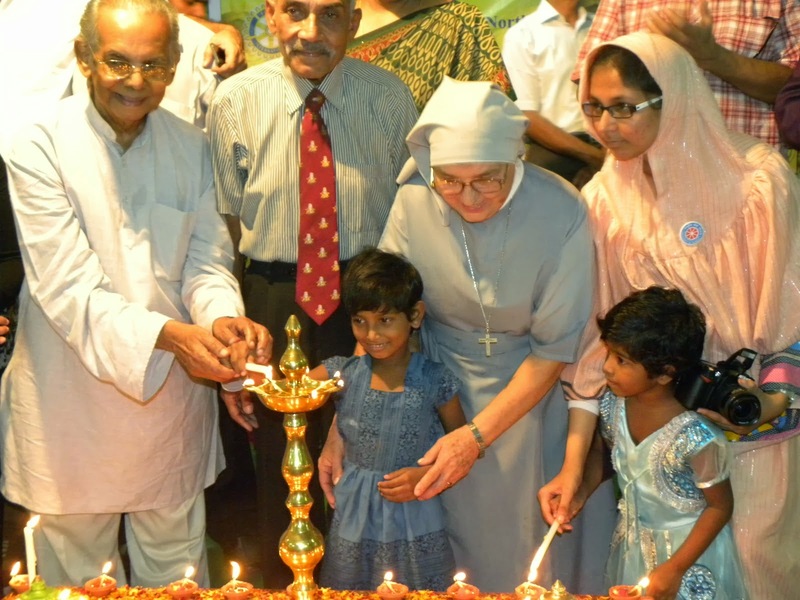 Sr. Catherine thanked team IDF for extending fullest support for the education of the girl child in the Bal Gurukul. 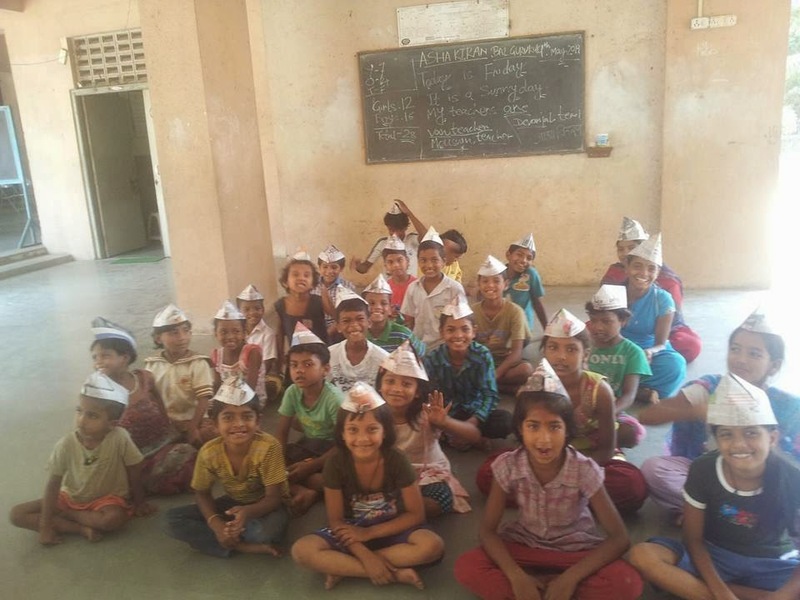 IDF is committed to spread smiles all around.... As on 10-10-14, IDF has 170 Bal Gurukuls in India catering to nearly 10,000 students. 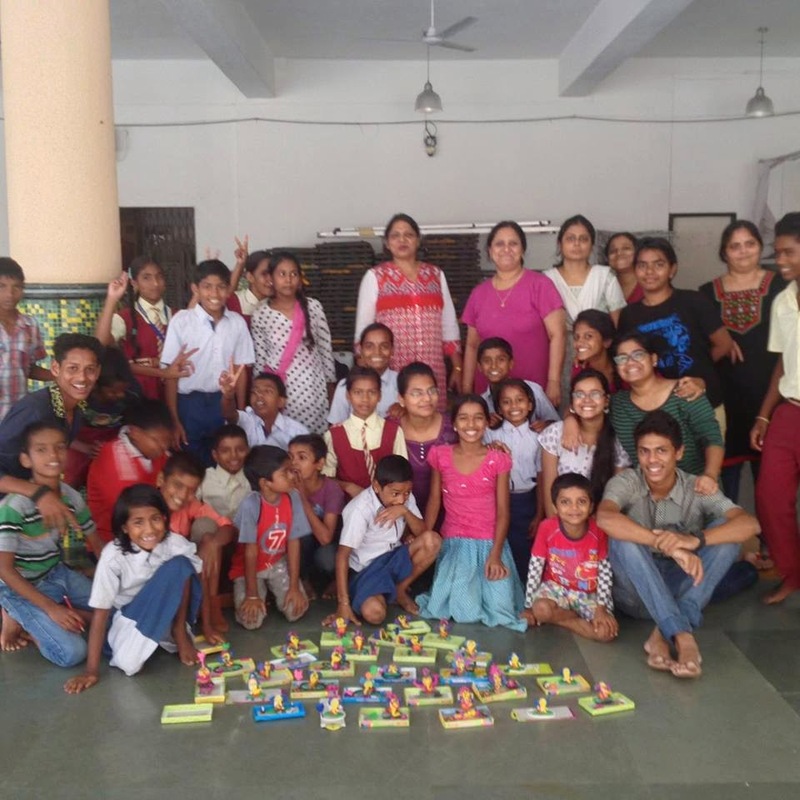 IDF Social Ambassador Sneha Kesarkar and her group, resident of Jyoti Complex ,Goregaon.Supports Mission W2K , donated the amount by selling 245kgs of old newspapers. 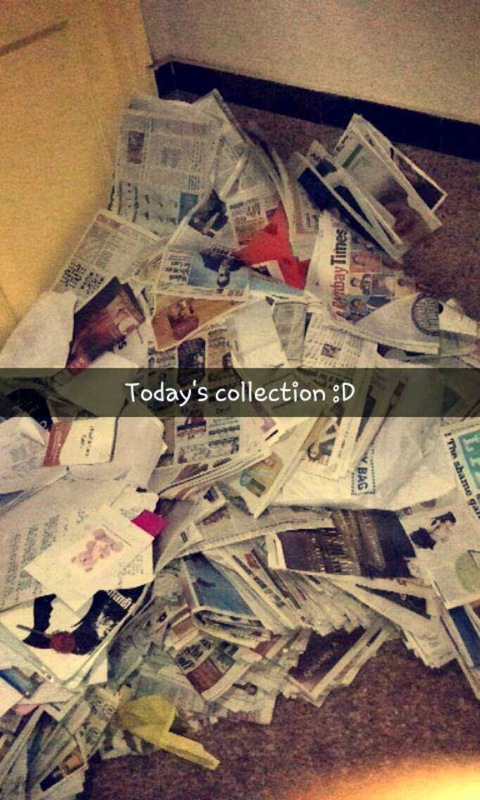 Many friends have volunteered to donate their monthly old newspapers and support the noble task, Dr. Narayan Iyer appreciated the wonderful social initiative of Sneha Kesarkar and her group and congratulated her promoting social causes. First ever speech attempted by Anisha (Tilak Bal Gurukul,Landadiyawas Village, Ramgarh, Jaipur) speaking at the IDF Annual Event for Northern Region held at Maharana Pratap Auditorium, Bharatiya Vidya Bhavan, Jaipur on 10th Sept. 2014. IDF Social Ambassadors Shraiya Singh and Priyanshi Pokharna studying in SMS Vidyalaya, Jaipur are a great source of inspiration to many young minds. Through their support and social initiatives, IDF has been able to reach-out many needy people and students. 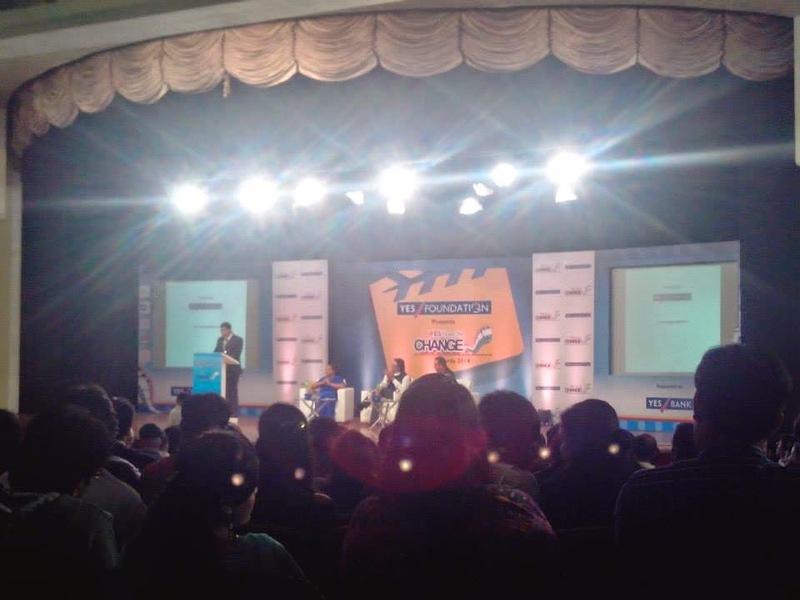 Sharaiya Singh And Priyanshi Pokharna speaking at the IDF Annual Event for Northern Region held at Maharana Pratap Auditorium, Bharatiya Vidya Bhavan, Jaipur on 10th Sept. 2014. Swacch Bharat Andolan at Sri Ayyappan School @ Bangalore. Swacch Bharat Andolan was organised at Sri Ayyappan School at Banglore. Mr.A.G.Prakash gave a speech on Mahatma Gandhi as well as on Lal Bhadur Shastry. IDF and Lions Club of Bangalore paticipated.The function ended with a happy note with distributing sweets to participants. IDF launched Clean India programme at Rajkiya Prathamik Vidyalaya, Lankapuri, Shastri Nagar, Jaipur on Gandhi Jayanti Day (02-10-2014). Indian Development Foundation and Prarambh Foundation jointly launched Clean India programme at the Govt. 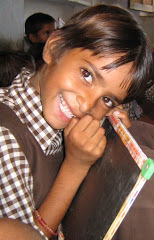 School in Jaipur. Students actively participated in programme and came forward with many suggestions which can keep the school surrounding and house clean. Students were presented with soaps for handwash. Also the school was gifted with mats, brooms and dustbin. Dr. Narayan Iyer spoke to the children on basic clean habits and asked students to become Clean Ambassadors. Mr. Ajeet Singh Chauhan, Mr.Sandeep Edwin, Mr. Kovid Oli and Mr.Simon Peter were also part of the Mission. Ms.Maina was all in tears as she received honours for her service. Ms. Maina who cleans and sweeps the school has pledged to take the mission ahead. Principal of the School Mrs. Kamlesh thanked IDF and PF for sensitizing the students on Clean habits.